The Land of Oz theme park in Beech Mountain has sold out for its six open days in June. Every Friday, the park will be open for visitors to take a “Journey with Dorothy” tour as part of Beech Mountain’s Family Fun Month. 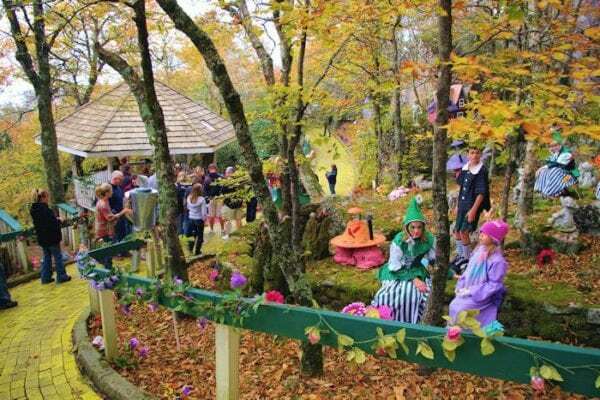 Listed in the Top 5 Things to Do in Beech Mountain, it’s not surprising that tickets for this month’s events at Land of Oz sold out almost immediately. After its original ten year run from 1970 to 1980, the Land of Oz was “in hibernation” for almost 35 years before reopening sporadically throughout the year for events. The first season of the theme park brought in over 400,000 visitors to the High Country to walk across the 44,000 yellow bricks that pave the way to Emerald City. In 1994, the original cast was invited back for a reunion. It was this reunion where the Leidy family created the idea of Autumn at Oz, which is now open annually. The Autumn at Oz event will be held September 7th, 8th, and 9th this year with tickets going on sale next Thursday, June 14th. Tickets are available online for $40 per person; children under the age of two are admitted free. These tickets will likely sell out fast, so don’t be a coward when purchasing! This year is the first year that the park will be reopened during the summer. The park encourages guests to feel the magic that so many people felt from the 1939 David Weiss MGM film and the original Land of Oz theme park. During the park’s “hibernation period,” many parts of the park were stolen or damaged. Although some aspects of the park have not yet been repaired, all of the proceeds collected in ticket sales go directly toward restoring the park to its original construction. During the “Journey with Dorothy” Tour, guests will be able to walk down the Yellow Brick Road with Dorothy to Emerald City. These tours are approximately an hour long, and many children and guests are invited to participate in the scenes played out during the journey. Guests are provided with a script at the beginning of the tour to take on a role during the tour. But, keep your eyes peeled—you will also be able to see Flying Monkeys, Munchkins, and maybe even Toto! Along the way visitors will be able to meet the Scarecrow, the TinMan, the Cowardly Lion, and even the Wicked Witch of the West before coming to the Emerald City amphitheater for a show, then heading back home on the park’s only “roller coaster”—a Balloon Ride that circles a track giving visitors a bird’s eye view of the park and the mountains. Throughout the year, the Land of Oz is available for other events such as personal tours, birthday parties, and private functions from June to October. Dorothy’s cottage is even available to be rented as a romantic getaway for couples. Although tickets are sold out online, there is a Facebook page to buy resale tickets called “Land of Oz Beech Mountain Events Venue Resale.” The page is run by Bill Bryan in tandem with the Land of Oz personnel. In order to purchase tickets through this page, you must also be a member of the “Land of Oz Beech Mountain” home page. Tickets from the resale page are sold at face value for $25 per ticket and have an additional $1 assistance fee. This page offers resale tickets for every open date in June. Parking and shuttle pick-up for the Land of Oz is available at Beech Mountain Resort, located at 1007 Beech Mountain Parkway, Beech Mountain, NC 28604.